"Toy: Nurse Doll I - 3" by Normadeane Armstrong Ph.D, A.N.P. 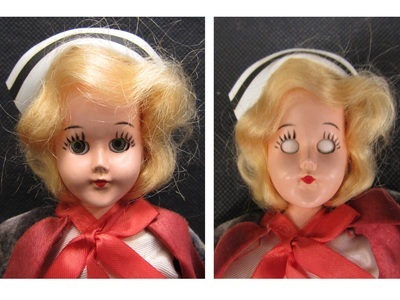 This is a blond-haired doll dressed as a nurse. The doll is dressed in white and has a blue/red velvet cape and a white cap with a black strip. The doll also features "sleep eyes."